Freshman guard Justin Mazzulla passes the ball during a men's basketball game against Richmond Wednesday. Men’s basketball scored more than 100 points for the first time in more than four years Wednesday night. The Colonials (13-15, 6-9 A-10) defeated Richmond 103–77 at the Smith Center, shooting a season-high 68.9 percent from the floor and going 10-for-14 from behind the arc. 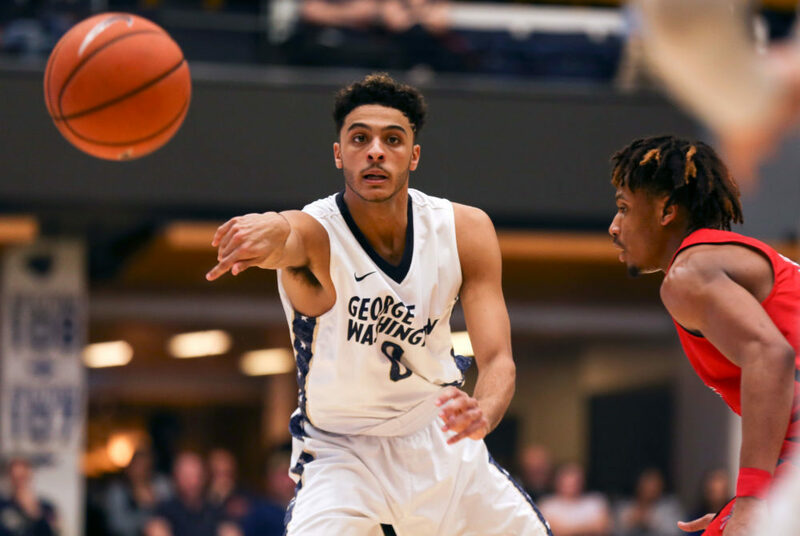 The Spiders (9-18, 7-8 A-10) were held to 42.6 percent shooting from the field and 6-for-24 from the perimeter after defeating GW by 10 earlier in the year. “We just really shared the ball, played aggressively, we guarded, we played angry about how the game went last time and we just came out and executed,” head coach Maurice Joseph said. The win is the fourth game in five outings in which the Colonials have scored 80 or more points in a game and extends their winning streak to three games. The Colonials turned in a season-best half when they racked up a 29-point differential against the Spiders, heading into the break leading 54-25 on 24-of-33 shooting, surpassing the season scoring record they set against VCU Saturday night. GW ended the first frame shooting 72.7 percent from the field. Senior forward Yuta Watanabe led the floor with 23 points and five rebounds on 8-of-13 shooting. He was followed closely by sophomore forward Arnaldo Toro, who earned a double-double with 16 points and 10 rebounds. Freshman guard Justin Mazzulla doled out a season-high 10 dimes on the night. The Colonials had six players finish the night in double-digit scoring, the most they’ve had all year. 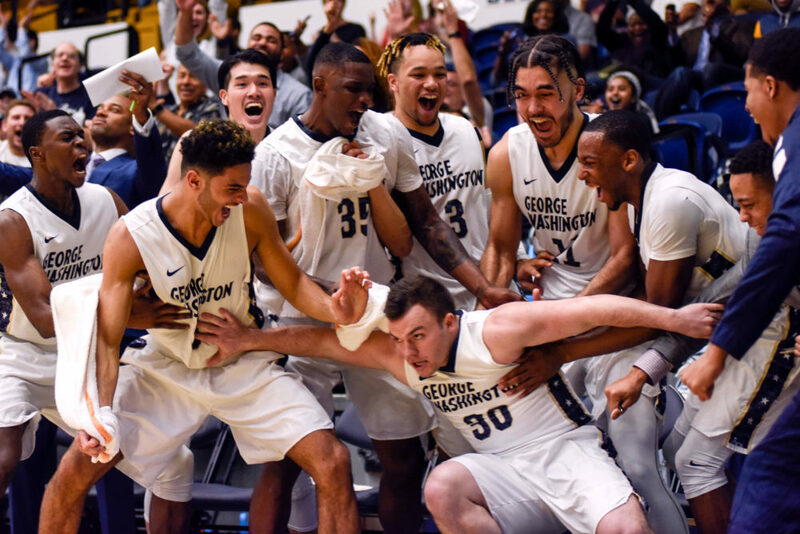 Men’s basketball players celebrate after senior guard Jack Granger makes his first-career shot in a men’s basketball game against Richmond Wednesday. Wednesday is the second game in a row they have beaten a higher ranked team. GW, ranked 11th in the Atlantic 10, defeated No. 5 ranked VCU Saturday and the Spiders sit at the ninth spot in the league. Heading into the rest of the season and tournament play, Joseph said understanding scouting reports will be key in future wins. To begin the night, the Colonials went on a 9-0 run to break away from the Spiders. They continued their offensive streak 10 minutes later, going on a 10-0 run to push GW’s lead to 35–19. GW’s 24 first-half makes was more than the team’s total baskets in 11 games earlier in the season. Heading into the break, not a single Spider tallied more than six points in the first half, but Joseph said the defensive effort still needed to improve. The Spiders outscored GW 52–49 in the second frame despite the Colonials’ substantial first-half lead. Richmond’s De’Monte Buckingham caught fire in the second half after being held to just six points in the first frame. The sophomore guard tallied 21 points and four rebounds to lead the Spiders. With one minute left in the game, senior guard Jack Granger sank his first-career basket to push the Colonials past the 100-point threshold. The Colonials return to action Saturday when they travel to Missouri to face off against Saint Louis. Tipoff is slated for 8 p.m.